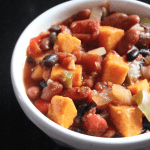 Vegetarian sweet potato chili is an easy and healthy meal to make in the slow cooker or crockpot. It’s a hearty and flavorful chili perfect for cold winter days! Anybody else buried under snow? This is my first blizzard while living in New York City and it is definitely one for the books. I mean, the mayor declared the city under a winter weather state of emergency—that does not happen everyday. When weather like this hits the big apple, it’s time to hunker down with a six-pack of beer and a big bowl of chili. Chili is one of those comfort foods that is just so darn difficult not to like. From manly-man beef chili to Tex-Mex chicken chili, the options are endless. This time around I tried my hand at a vegetarian chili using sweet potatoes, plenty of beans and an array of vegetables. It turned out splendidly (thanks to my sister who inspired me). The unsweetened cocoa sounds a bit out of place, but it made a subtle difference that really complimented the chili seasonings. Sweet potato is one of my favorite foods in the cold months. It adds a gorgeous color to any dish and adds a sweetness that I typically crave. 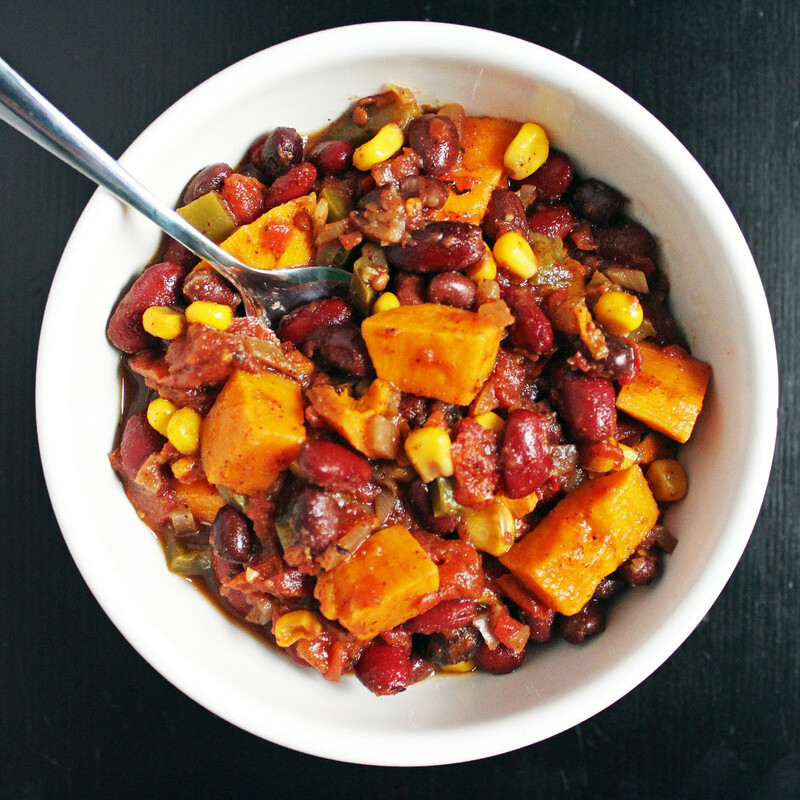 When the sweet potato chunks are slow cooked, they become nice and tender while absorbing all the chili flavors. The medley of beans, pepper and onions provides plenty of fiber, making this a very filling meal. I usually pack it up into tupperwares and have lunch/dinner for the week! If the ingredients haven’t swayed you, then the magic of the slow cooker will. Throw all these ingredients into the crock pot and sit back. There is little work needed with this recipe, just let the sweet smell of comfort food fill the house. 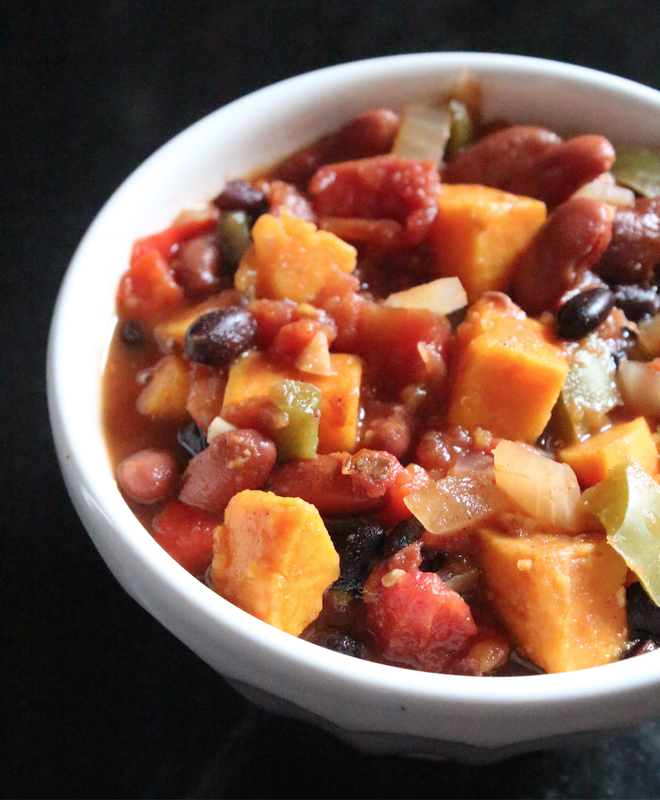 By dinner time you will be pleasantly satisfied this vegetarian chili. In a 4 to 6-quart slow cooker, combine the onion, bell pepper, frozen corn, garlic, chili powder, cumin, cocoa, cinnamon, salt and black pepper. Add the tomatoes (and their liquid), beans, sweet potato, and 1 cup water. This turned out great! I like my chili a little bit spicier, so I added more of the chili powder, cumin, and black pepper. I also added some paprika, Hungarian wax peppers , and jalepenos to give it some more heat. Topped it with a dollop of plain greek yoghurt and cilantro :). Made this today and it was fantastic!!! My family and my boyfriend loved it as well!! Thank you! I made this a few months ago and it was SO GOOD. Can’t believe it’s taken this long to make it again! So happy you enjoyed it, Beth! Thank you for this recipe!! This was incredible!!! The flavors really worked well together. The only thing different I did was I browned a pound of ground turkey in a skillet and then added it to the crockpot with about 2 hours left of cooking time. It made an already great recipe even better. I LOVE that idea, Dani! Excellent way to get protein in this chili. I’ll have to try that next time I make it! My favorite vegan chili! I started adding a chopped jalapeno to give it a kick of spice, and it’s PERFECTION. I don’t have a crock pot, do you have instructions for a regular pot? Do you know the calories for this? I’m excited to make this. But Ij have a question, do I include the bean juice also or just the juice from the fire roasted tomatoes? Just the juice from the fire roasted tomatoes. I suggest rinsing the beans before adding.